Eldred Henry became the BVI’s first athlete to win National Jr. College Championships titles in two different events. He won the Shot Put with a heave of 18.63m and defended his Discus Throw crown with a 50.21m effort. Central Arizona College sophomore Eldred Henry not only repeated as National Jr. Colleges Athletics Association Championships Discus Throw champion, but added the Shot Put crown as well, while Trevia Gumbs claimed Shot Put silverware, during the competition held in Hutchinson, Kansas. In tune up for a successful Discus Throw title defense, Henry tackled the Shot Put on Friday morning, moved from third in the competition to seize the lead with his fourth round attempt of 18.07m, then had his best throw of 18.63m in the next round of the competition to seal the victory. 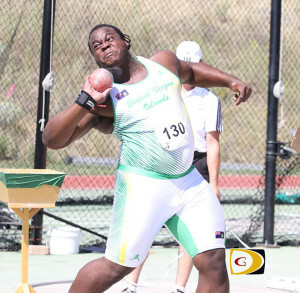 Then in pouring rain on Saturday that interrupted the meet, Henry became the first BVI athlete successfully defending a Collegiate title at any level of competition, when he won the Discus Throw crown. Henry, who came into the meet as the top seed in both the Shot Put and Discus Throw, had a toss of 50.21m on his fifth attempt for the repeat victory. His season’s best is 56.27m. Henry was coming off improving his National Hammer Throw Record of 45.71m with a heave of 47.48 to finish 11th. By winning the two titles, Henry picked up his third outdoor All America Honor and already has five to his credit—as BVI athletes have earned eight of 15 overall in 2015—including indoor championships honors. Trevia Gumbs finished second in the Women’s Shot Put with a heave of 14.69m—the second best mark of her career—while twin sister Tynelle was 12th with a toss of 12.50m. Trevia also improved her Hammer Throw record from 47.35m to 47.66 in placing 11th in the competition, while Tynelle finished seventh in the Javelin Throw with a 36.25m measurement. In a competition that lasted more than eight hours because of stormy weather that caused numerous delays as well and was affected by lightening delays, Trevia placed ninth in the Discus Throw. She had a best distance of 39.97m, while Tynelle fouled out of the competition. Central Arizona College finished second in the competition with 101 points in the Men’s Division, which was won by South Plains, with 162½. South Plains’ Women were also victorious with 118 points while Central Arizona was fifth with 54. Competing in the Cayman Islands Invitational on Saturday evening, sprinter Ashley Kelly was second to the USA’s Romero Shapri in the 400m dash with a season’s best of 53.31 seconds, behind Shapri’s 51.93. She was fourth in the 200m in 23.95 seconds. After a 54.74 seconds season debut in St. Maarten last week, Kelly said she’s working on a few things and practice is great. “I’m eating well, taking care of my body and everything but I need to show up on the track,” she said. Wind aided marks were the order of the day in the 2nd Pure Athletics meet in Clermont, Florida. Karene King was sixth in the 100m prelims in 11.64 in a race that had a +3.7 mps reading. She finished eight in the finals in 11.50 with a +4.5 tailwind. She ran 23.92 in the 200m for second in her heat. The race had a +3.1 wind reading. Deya Erickson placed fifth in the 100m Hurdles in 14.41 seconds. The race had a 2.3 mps wind measurement.